This series of precision inverter air conditioners delivers perfect cooling and offers you a wide assortment of tonnage to choose from. This 5-star rated range of ACs that are also equipped with an eco-friendly refrigerant are ideal to add grandeur to your room! 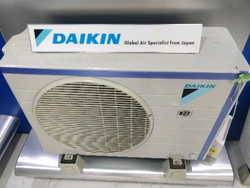 Daikin Inverter ACs are energy efficient ACs. An inverter modulates power supply frequency to control motor rotation speed which in turn provides temperature stabilization, precise control & energy savings. A typical residence of two bedrooms and a living room requires 4.5TR (3 x 1.5TR) of airconditioning. However, only two rooms are occupied at most points of time. Traditionally this means installation of three ODUs and three IDUs, each of 1.5TR capacity, occupying more ODU space resulting in clutter and spoiling the facade. Every Trane Interactive AC is packed with high-quality components. Each helps ensure time after time, your unit will provide total comfort your family can rely on. We are ranked on top by offering the best quality of Inverter Air Conditioner, which is known for its remarkable finish and quality.